← Bike as a second home? When I ride along Glebe Road in Adamstown, I mostly ride on the footpath. The road consists of 4 lanes of fast traffic while the footpath is usually empty so it makes sense to me to ride there. So it was with interest that I saw the above works taking place this week: they are widening the path! I am assuming of course that it is to make it a shared path. This will form a much better link between many bike routes which converge in Adamstown, so naturally I am pleased about this. I also recently saw this video and it made me a bit depressed, not because it shows poor infrastructure, but because it says that the city of Groningen in The Netherlands decided to stop entry of cars to its city centre in the 70s so that the city centre did not continue to fill up with cars on the roads and parking in the piazzas. Of course, the city centre is now much more attractive and user friendly. It made me think, would this ever happen here? And the answer has to be “highly unlikely”. The closest we have to this type of commitment to improving city conditions is Clover Moore in Sydney, who incurred the wrath of many motorists, voters and politicians with her new, and highly successful, bike paths. But even this amount of commitment is unlikely here. While I like very much that Newcastle is linking up its bike paths and tracks and is making the city better for cycling, I despair of it ever being able to make changes such as those made in Groningen and Sydney, and this is the sort of commitment that is needed to make us a true cycling city. 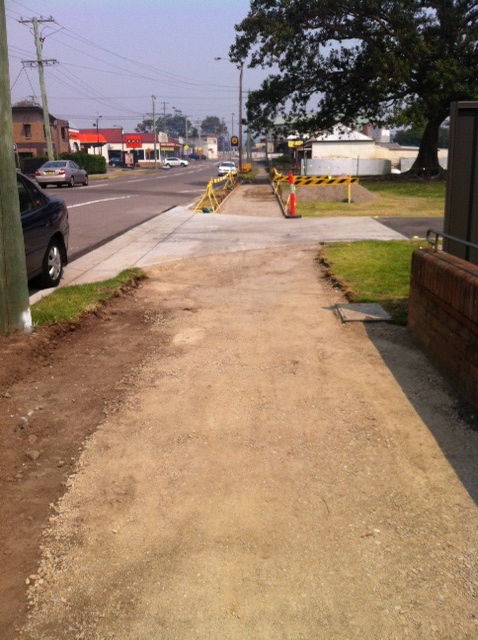 This entry was posted in Uncategorized and tagged Adamstown, cycleways, infrastructure. Bookmark the permalink. 2 Responses to Is creating better links in the cycling infrastructure the answer? Great places Groningen and Assen [ home of the Dutch TT ], I always go there for a visit, in summer, and the most pleasant way to travel is by bike, the only problem is the language, it’s like speaking German but with a throat condition. Wayne you are lucky to have lived there and to be able to still visit and speak the language. The best way to get around much of Newcastle is by bike too, I just wish people could see that.